Another dish which holds fond memories of my childhood is of Dad making us breakfast on a Sunday. Dad still makes the best French toast - gently soaking the bread in a custard mixture of egg, milk and sugar and then shallow frying it on a griddle till is golden brown. I now make it for myself and lately for my daughter who has come to enjoy it -especially when she heard the story of how her Thatha used to make it for me. Everytime she eats it though, she stoutly insists that "Your French Toast is the best, Amma!" And so the story continues. There's really not much to actually warrant a recipe - one egg, about 1 cup of warm milk and 5 tbsp of sugar. 1.Dissolve the sugar in the milk and then lightly beat the egg into it. Pour the egg milk mixture onto a shallow dish. 2. Heat a heavy non stick skillet and melt some butter in it (about a tsp per slice of bread). 3.Dip a bread slice into the milk and soak for about 30-40 seconds before turning and soaking again. Gently moisten the edges as well and then cook on the hot skillet on a medium flame turning till each side is golden brown. This was my adaptation of French Toast for hubby who can't abide by sweet things for breakfast - I myself don't like sweet stuff in the morning - French Toast is the exception. Replace the sugar with a mixture of salt and green chilli-coriander paste. (Grind 2 green chillies with a a cup of cleaned coriander). Go through steps 2 and 3 as above. A recipe I found in a 2002 edition of Good Housekeeping magazine and have tried a couple of times as part of brunch.Very decadent, though savoury. 1. Put a slice of cheese between 2 pieces of bread and cut diagonally into a sandwich. 2. Mix the eggs with salt and put into a large shallow bowl and beat. Add the sandwiches and leave them to soak for 30 minutes, turning them once over, halfway through. 3. 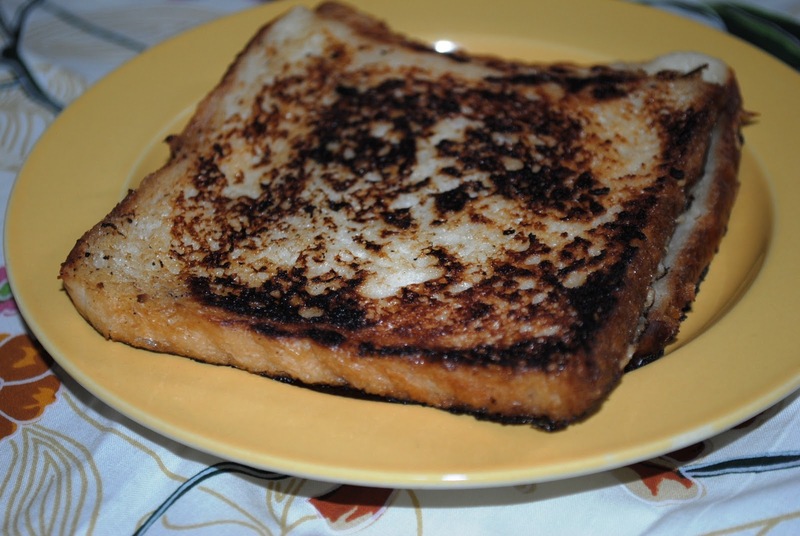 Heat 1 tbsp of oil in a frying pan, press the edges of the sandwich firmly together and fry till golden brown. This, and croissants, are the only sweet breakfasts I can stick. 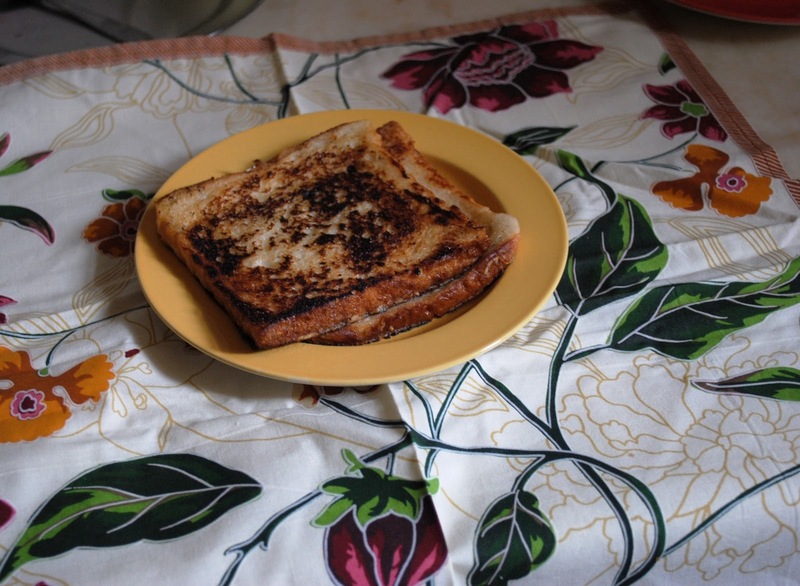 My grandmother used to make the best French toast - I can't ever replicate it. I think it's because the bread we used to get those days was better - and the slices were thicker. Today's bread just dissolves the minute I put it in the custard! Have never tried the sweeter version of french toast. mostly make the savory ones. anything associated with childhood holds a special place love the clicks. This is a Sunday breakfast special for lil S..He loves it...Your masala french toast recipe is a fav with me...cant have sweet stuff in the mornings !! 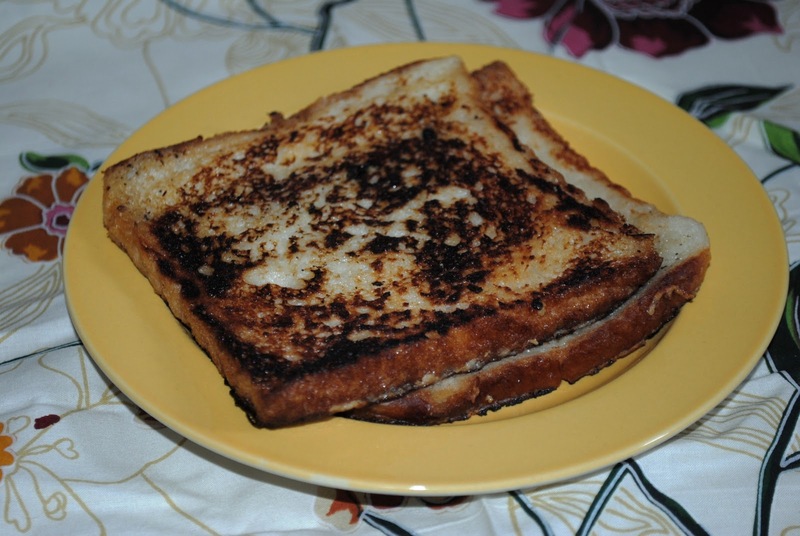 Masala (savory) french toast sounds great !!! A few years ago...I went back to this memory...and realised, it is one of the most decadent breakfasts! You really feel you have indulged yourself; a great way to start off a Sunday. That sugar caramalised is the best thing ever. The only change I have made to the recipe in this older age is that I drizzle a bit of cinnamon sugar... :) Even more decadent!